The bitterly fought Pluto wars of a few years back showed that even the experts disagree on what is and what isn't a planet. One thing there's no quarrel about, of course: a planet is, by definition, something that orbits a star. Except, it turns out, when it isn't. Writing in the latest issue of Nature, a team of astronomers is reporting the discovery of 10 objects roughly the size of Jupiter that seem to be on the loose, roaming the galaxy untethered to any star. And while 10 seems to be an insignificant number in a galaxy packed with 200 billion or more stars, the search was an extremely limited one. Unless the observers happened to be absurdly lucky, there could actually be a lot more of these rogue Jupiters  perhaps twice as many as there are stars in the Milky Way. "The implications of this discovery," writes Joachim Wambsganss of the Center for Astronomy at the University of Heidelberg in an accompanying Nature commentary, "are profound." They aren't, however, completely unexpected. As the known number of conventional exoplanets  that is, those that actually do orbit stars  has grown to more than 500 in recent years, astronomers have begun to realize that our well-behaved solar system isn't necessarily typical. Its eight planets orbit the sun in nearly circular orbits, all moving in the same direction as the sun's rotation. But plenty of alien worlds orbit their stars in eccentric, somewhat egg-shaped orbits, and surprising numbers move around their stars in highly tilted orbits as well. (Nonplanet Pluto inscribes just such an inclined and elliptical path.) Some planets even orbit backward. That suggests that sometime in the past, close gravitational encounters with other planets flung them out of their previously conventional orbits. Theorists have predicted for years that such close encounters might also fling planets out into interstellar space. 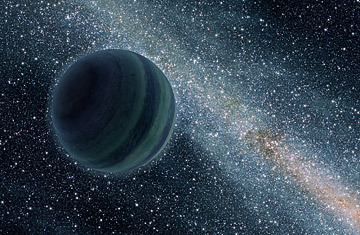 "There's nothing physically mysterious about this," says David Stevenson, a Caltech astronomer who has been working on rogue-planet scenarios for more than a decade. "It's a perfectly natural outcome." Still, he says, it's exciting to see something that had been purely theoretical backed up by hard evidence. It's also notable that these planets were discovered with a technique that sounds like something out of Star Trek. As Albert Einstein explained nearly a century ago, the gravity of a massive object such as a star or a planet warps the space-time that surrounds it. If a ray of light passes close by, the light will be diverted as though it were passing through a giant lens. In the 1930s, Einstein realized that if one star passed in front of another, the closer star could act as a gravitational lens, focusing the light of the more distant star and making it look brighter. We'd never actually see such an effect, conceded Einstein. All stars orbit the center of the galaxy at slightly different speeds, meaning that they are in constant motion relative to one another; the exact lineup necessary to make true lensing occur would happen only very rarely, Einstein believed. For once, though, the great man was wrong. The first gravitational lens was spotted in 1979, and they've become a mainstay of astronomical research ever since. This has aided in the search for exoplanets, as astronomers scan the skies for double flashes  one caused by a foreground star moving in front of a background star, and one following soon after, caused by the orbiting planet. It's not the most efficient way to discover planets, since you never know when just the right lineup will occur, but about a dozen star-planet pairs have been found with this technique. The 10 free-floating planets revealed themselves the same way, but what distinguished them, says Takahiro Sumi of Osaka University, the study's lead author, is that when they pass in front of a background star, "we don't see any evidence of the host star." Not, at least, within a billion miles or so of the planets, and based on more conventional studies of exoplanets, that suggests that many if not all of the planets indeed have no host star at all. The one caveat offered by both Stevenson and Wambsganss is that while these objects are certainly similar in mass to Jupiter, they could, in fact, be more like small stars, having condensed as the central object out of a swirl of cosmic dust and gas, albeit without sufficient mass to light their nuclear fires. Conventional planets condense out of similar clouds, but they are made up of the leftover dust a parent star didn't use. Some planetary theorists argued that the term "planet" should only apply to the latter, even if two objects have exactly the same mass. But offsetting that caveat is an even more exciting possibility. If close encounters can throw Jupiter-size planets out of a solar system, they can throw smaller, Earth-size worlds out even more easily  meaning they may outnumber even the hundreds of billions of drifting Jupiters. The brief magnifying flashes they produce would be very hard to detect from the ground, but a proposed space telescope known as the Microlensing Planet Finder could do it  and even find planets as small as Mars. In theory, the mission could fly by 2020. In these days of reduced budgets, however, there's no guarantee that it will actually happen. But if it does, we may soon know what the theorists already suspect: that the Milky Way is teeming with free-range planets of all sizes, floating silently and forlornly in the spaces between the stars.